People lined up outside OCAD U’s professional gallery, Onsite, the evening of January 10 to gain entry to The Sunshine Eaters, a new exhibition curated by Lisa Deanne Smith. Once inside, the capacity crowd took in Nick Cave’s glittering sound suits and Ebony G. Patterson’s embellished Jacquard fabric wall work. Delicate lilies made of bronze float beside two scent stations evoking places in time. 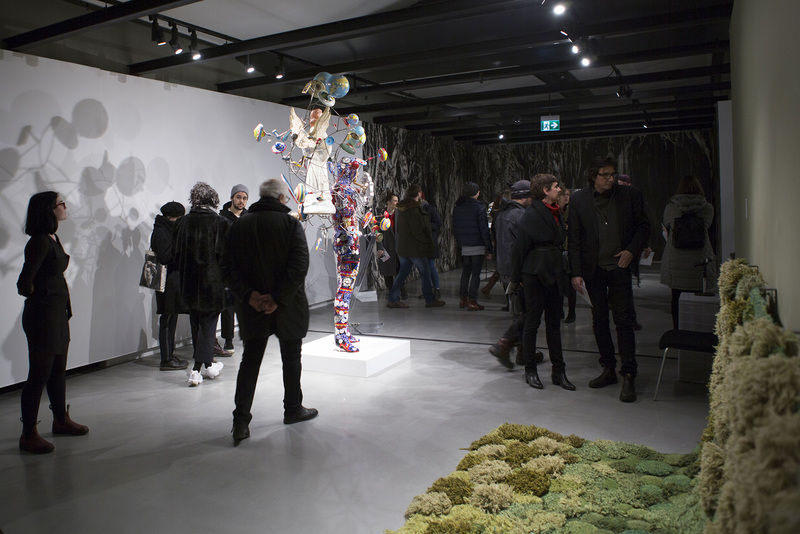 Mediums on display include film, video installation, scent, sculpture, painting, drawing and textile. Shary Boyle created three new sculptures specifically for the exhibition. Earlier in the evening, the auditorium at 100 McCaul St. was overflowing for a talk by visual artists Patterson and Cave. The free exhibition runs through to April 15, 2018, with a number of free talks and events. See the exhibition listing for more information. Wednesday – Noon to 8 p.m.
Thursday & Friday – Noon to 7 p.m.
and performance, and is exhibited and collected internationally.